To help you understand your water bill, please refer to the image above with the corresponding descriptions below. A. READ DATE is the time between meter readings for your water usage. DATE FROM indicates the date of your last meter reading from the end of your previous billing cycle. DATE TO indicates the end date of your current meter reading. B. METER READING represents the actual meter readings for the respective read dates. C. CONSUMPTION 1,000 U.S. GAL is the amount of water usage registered through your water meter based on the read dates. This number is represented in thousands of gallons. For example, usage of 15,000 gallons consumed would be 15. D. CURRENT AMOUNT indicates the cost of water for the usage period of the invoice. 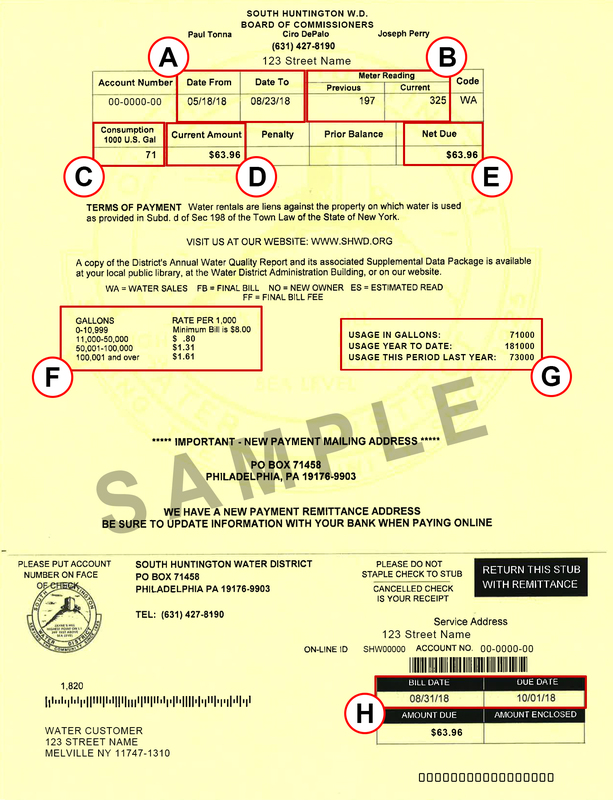 Water bills are calculated using the water rates indicated on your invoice. E. NET DUE indicates the current cost of water usage. This amount also includes any prior balances and/or penalties that may have accrued on your account. F. CURRENT WATER RATES reflect a tier-based rate structure intended to promote water conservation. The rate structure has four usage-based tiers to provide a financial incentive to conserve water. G. USAGE IN GALLONS shows the usage for the current period, usage for the year to date, and usage during the same time period last year. H. BILL DATE indicates when your bill was generated. DUE DATE is the date when payment must be received by the District.